WASHINGTON (AP) — President Donald Trump’s former campaign chairman was reprimanded by a federal judge Wednesday for speaking publicly in violation of her gag order in his criminal case. The rebuke of Paul Manafort came as he pleaded not guilty to the latest charges brought by special counsel Robert Mueller’s Russia investigators. 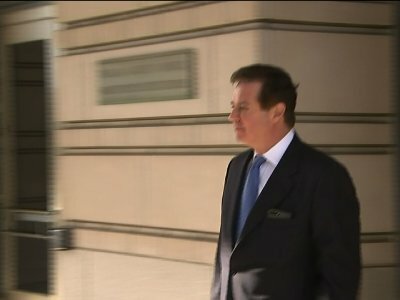 Manafort appeared at the federal courthouse to enter a formal plea to a second indictment accusing him of acting as an unregistered foreign agent and directing an international money-laundering conspiracy stemming from his political work in Ukraine. It was his first court appearance since his co-defendant and longtime business associate, Rick Gates, pleaded guilty and agreed to cooperate with prosecutors. Manafort had previously pleaded not guilty in the case, but the latest indictment, which mirrored the charges filed against him last October, required him to formally enter a second plea. Manafort also faces charges in Virginia accusing him of tax evasion and bank fraud. During the hearing, Judge Amy Berman Jackson set a Sept. 17 trial date for Manafort and reprimanded him for making a public statement last week about Gates’ plea. She said his statement violated an order she put in place early in the case, which bars Manafort, the prosecution and witnesses from making public statements that pose a “substantial likelihood” of prejudicing potential jurors. “I can certainly understand the impulse to not let that go by without asserting your innocence,” Jackson told Manafort, referring to Gates’ plea and “hundreds” of news articles about it. But it can’t happen again, she said, or she could hold him in contempt. Manafort’s lawyer, Kevin Downing, told the judge his client would appreciate more guidance from the judge on what he can and can’t say publicly. Downing also said he plans to file a motion challenging her order. “For reasons yet to surface he chose to do otherwise,” Manafort said. Manafort is due back in court later this week, this time in Virginia, where he faces a separate indictment involving bank fraud and tax charges. The allegations stem from much of the same conduct outlined in the Washington case, and prosecutors attempted to have all the charges brought in the pending case there. But Manafort objected, resulting in his facing two indictments in two different places at the same time. On Wednesday, Jackson said the situation could lead to a lot of duplication for both sides. Prosecutor Greg Andres acknowledged the overlap in the two indictments but said any request to combine the case would be Manafort’s to make.